So I was filtering through several of my games this evening when I noticed a slight weight difference in a few of my 5 screw carts. The adaptors are primarily found in early 5 screw carts. The 5 screw carts will not have tabs on the top of the cart like all? 3 screw carts have (easy to spot in any store). The connectors on the board will have tiny outcroppings to one side as opposed to in the middle. Assuming the example above = |-- , the 5 screw cart pins that do NOT have an adaptor and look like the 3 screw carts = -|-. If I can remember I'll take a picture of what I'm talking about tomorrow since my phone just died. Man, you lucky dog, you. I've had (and tested) so so SO many of those games, probably a 100 Gyromites, and the only game I've ever had one in was my Wrecking Crew that I gave to a friend so he could convert Famicom games. Well now you know what to look for! The pins are the tell. ya when I found my Gyromite cart, all I knew was that it would be heavier. It just makes sense to look for the weight difference, I didn't know about the pins until later. 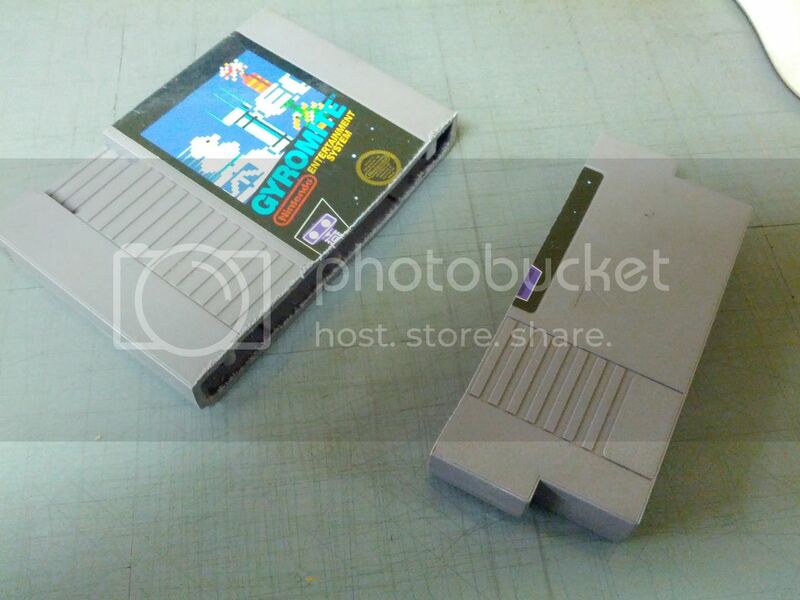 I've looked thru probably 50+ gyromite carts in the wild and only ever found one. Puchased it for 3.99! I have looked thru quite a few black box five screws and have yet to find one. Good haul on converters!!! Are you looking for one to sell or to play imports? I'll get some imports some day, but it was more about having one I guess. I have a Gyromite with converter and one without in my collection. I continue to look because I figure they would make good trade stock. And stickied for good info. Figured I'd write this up here, since we have the thread stickied and all already. 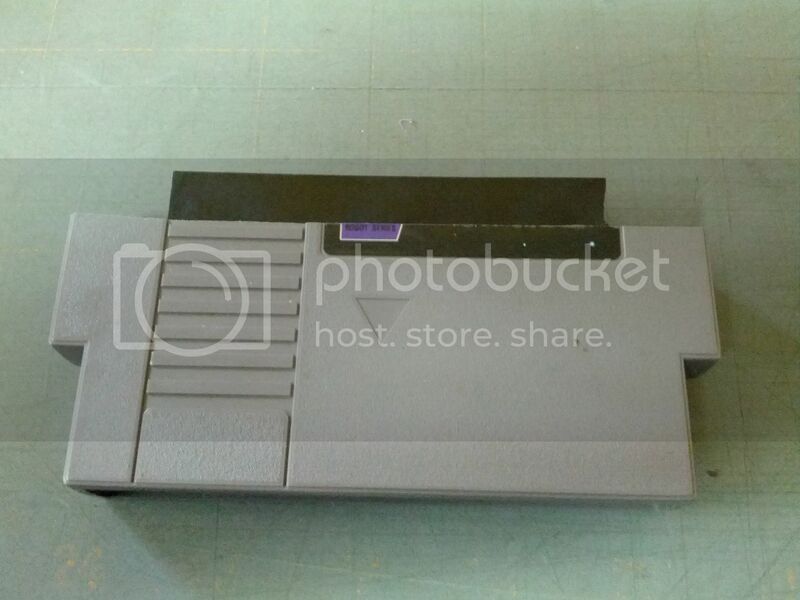 I finally got around to cutting up my extra Gyromite cart for the Famicom adapter. After marking how deep I needed the cut on the cart, I took it to the band saw and cut it down while both halves were still screwed together. This way, both of them are exact matches to each other. The blade on the bandsaw walked a little, so I needed to trim a little more off to correct it, and still ended up with a little walk in the blade. But it should be fine. 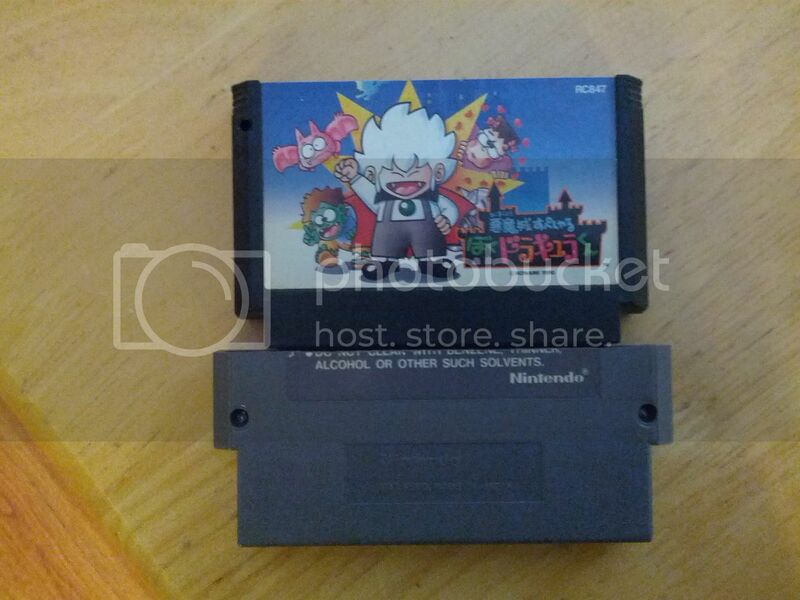 Once that was done, cut the tabs off of the adapter itself, so the Famicom carts will clear to the contacts. Then I just used some 2 sided tape and built up a few layers. Once that was done, I screwed the 2 remaining screws into place and viola! 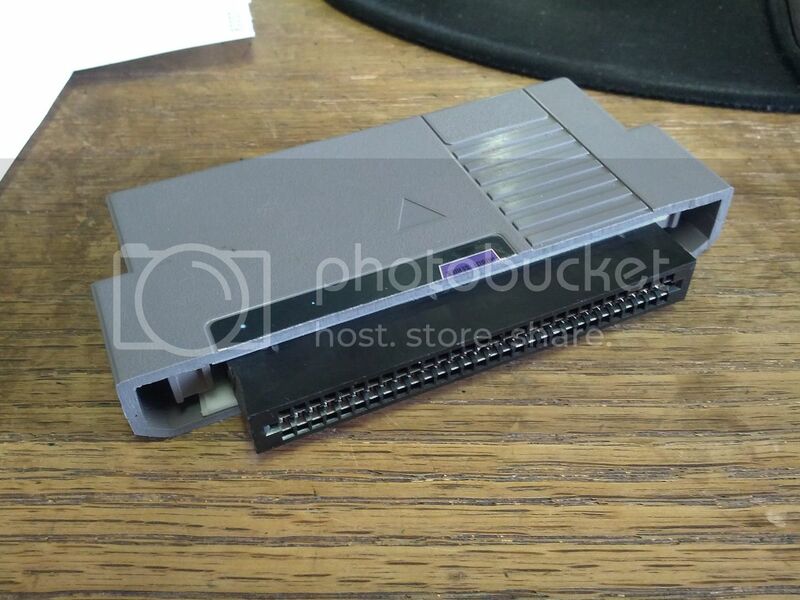 "Instant" Famicom Adapter cart! Taped in place. You can see the layers of double sided tape. I used some industrial stuff that I have around work. But any good 2 sided tape should work fine. I needed to do 2 layers on the front and 3 on the back to help fill the gaps. The only thing I want to do yet is make up a couple labels and get rid of the left over Gyromite art and the Nintendo warning label. If my measurements are right, the Famicom carts should but right up to the Gyromite cart and there shouldn't be a gap at all. 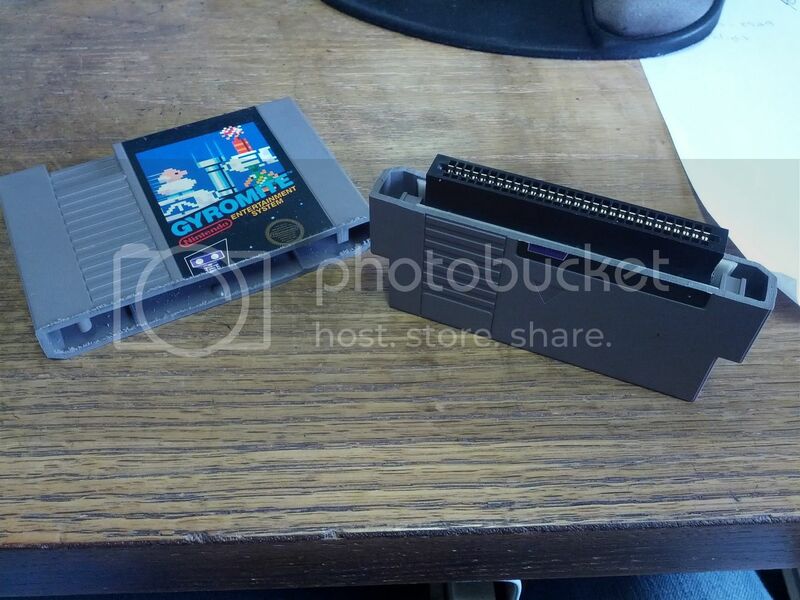 Of course I didn't feel like taking my Kid Dracula cart to work for testing. So, I guess I'll find out tonight. Oh and here's the Kid Dracula plugged into it. Works pretty good! now all you need to do is a attach a ribbon of some sort so you can put it into a front loader and still be able to yank it out. In case anyone is wondering. Here is a list of games that are known to have Famicom Converters in them.